I was able to find a basket that fit out tree stand very snugly and tested it out before we found the tree. We placed the tree in the stand outside and then lifted it up and placed it in the basket before bringing it in. I also trimmed a bunch of lower limbs. 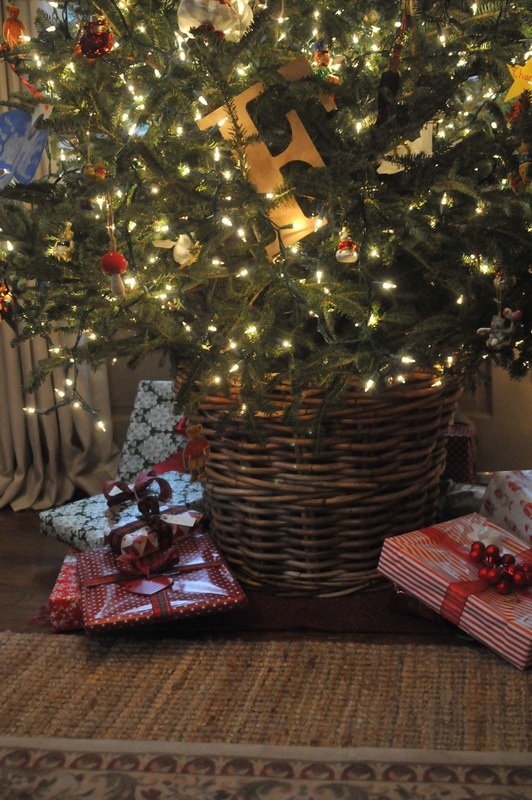 We then tilted the tree and basket to bring it indoors. After straightening everything up it fell down once, then twice and then a third time. Boo. The basket was just too snug! Sooooo, off to Homegoods I went in search of a larger basket. The diameter of our tree stand in about 14 inches and I choose a basket that iss about 16-17inches in diameter. The second time was a charm. I got a little carried away stringing the lights. Forgetting that our old house outlets can only stand so much - four strands burned out this year. After the ornaments went up, of course. We also didn't keep many gifts out just in case of leaks. Which worked just fine, because Charlie was far too curious about the presents this year. They likely would not have remained wrapped till Christmas. Santa made sure there were no spills on Christmas Eve! We will definitely do this again. I loved the way it looked and now that we have a little know how under our belt, next year should go much more smoothly! I do think a flat bottomed tree stand is a must though if you are going to attempt this with a live tree! LOVE it! Thanks so much for sharing. I saw your pics on instagram and couldn't wait to hear about it. Love love love! Tessa that looks awesome we may have to try it next year !!!! love this look! 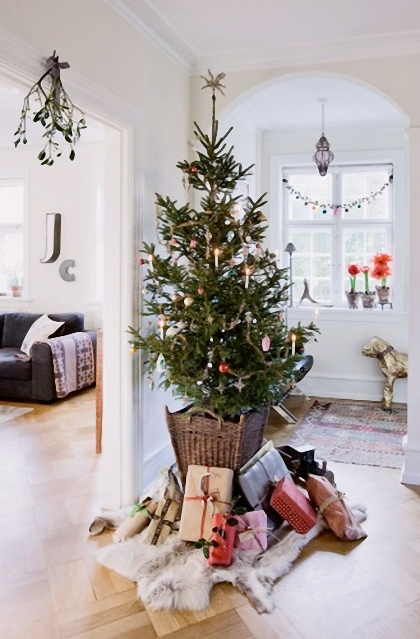 we did this with our artificial tree for about a day until I bought a new tree and unfortunately it's stand did not fit into the basket I had already and I never got around to finding a larger one. 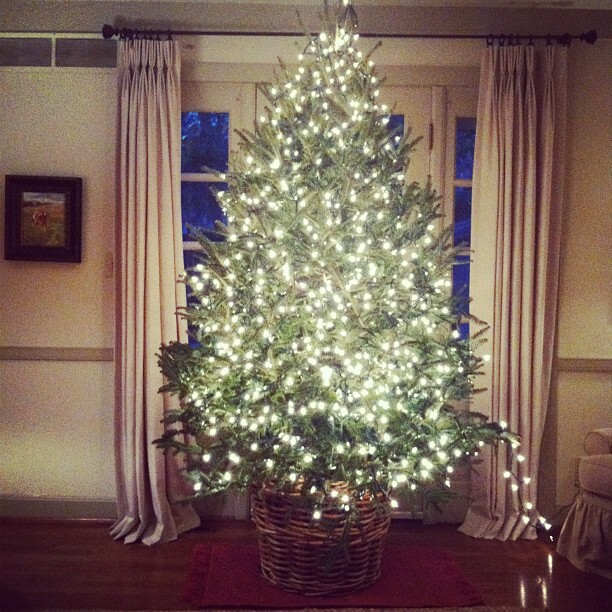 Next year though I hope to do this with the new tree we bought, it will make it look even more perfect! Love how your tree looks. Merry Christmas! Tessa, thanks for the tips. Your tree is gorgeous and I love the basket look. I had seen directions for it in a magazine and they said to cut out the bottom of the basket. That way the tree stand would sit directly on the floor. My husband is very skeptical of the whole basket idea though, so I doubt we'll be trying it in the future. oh, that is a such a smart idea too! 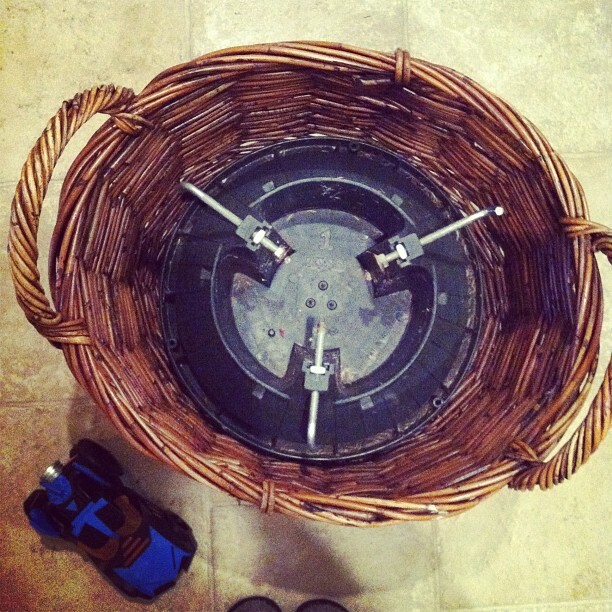 not sure if I would be able to cut the basket very neatly but I do love the idea. ours felt very stable once we had the right basket, i think finding the right basket is the key! We did this with an artificial tree and the tree stand did not fit at all! So we put the bottom of the tree in the basket and fit bricks and pieces of wood (slated for use in the fireplace) around the tree. It worked like a charm and helped to keep the basket nice and sturdy (a plus since my 15 month old son tried to climb the tree on multiple occasions!) Thanks for the inspiration! I love the look of the tree in a basket. I thought about doing it this year but that was one of the many things I never got around to! Maybe I should start planning for next year now! Happy New Year to you! I love this look as well, Tessa! Looks awesome Tessa! I think I'm going to go for it next year. I'm wondering if it will work with an artificial tree since I can't really trim the bottom branches. I'll keep my fingers crossed ;) Thanks for the tips! I purchased a basket ring for our tree this year from Splendid Willow, It works great, The bottom and top are open so it just sits on the floor and the tree stand sits evenly on the floor. 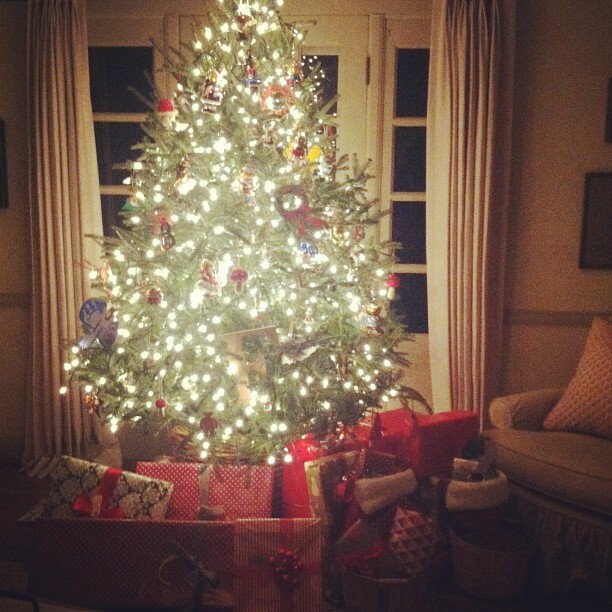 Love the look, especially when there are no presents under the tree. 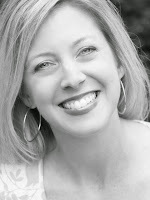 So happy I stumbled upon your blog and this post in particular. We were going to use a basket this year and never quite got around to it. Happily, I will remember your tips for next year. Thanks for sharing! I love this tree! what kind is it? It was a few years back, but I found ours a Home Goods. Good luck! Recipe | The BEST Soft Pretzel You'll Ever Eat! !